Most University students care about the dangers of climate change. The furore surrounding Bjorn Lomborg’s proposed ‘consensus centre’ at UWA, the ‘bare-all’ protest by students at the University of Melbourne in response to it investing in fossil fuel companies, the sit-in protest at Columbia University for similar reasons and countless other examples prove this. We care about our planet and the way the human race is destroying it in an unprecedented fashion. The same cannot be said about greedy corporations, such as Exxon and Chevron, who siphon off this planet’s resources and emit untold amounts of carbon into our atmosphere. The reason for this? To obtain the absolute maximum profit possible without any sense of basic human decency and care for the earth that we all inhabit. Located below is an article written by the Guardian’s Bill McKibben, it details one such example of corporate greed at the expense of the rest of us. He laments the fact that Exxon, a multinational oil and gas company, knew about the dangerous effects of climate change since the 1970s and simply stood idly by and did nothing except delay action and conversation on climate change which could have vastly improved the position in which we find ourselves now. The result of this? One of the things we Australians hold dear to our hearts is our pristine reef and its crown jewel, the Great Barrier Reef. 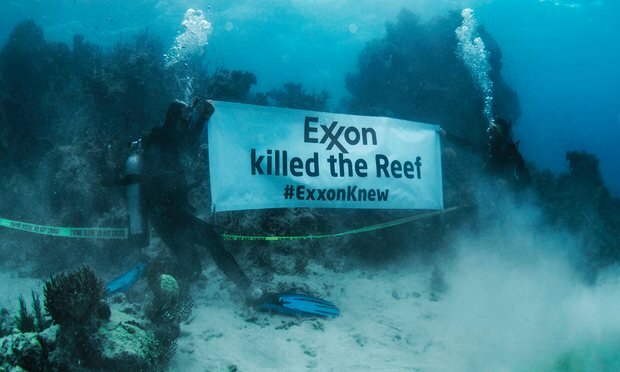 What it is experiencing now is a ‘coral massacre’ as McKibben terms it, and only these multinational corporations, such as Exxon, are to blame. Please read this article below, understand what these corporations are doing to us and our planet, and continue to use your capacity as University students to try in influence change. Continue your protests! We cannot sit and do nothing whilst our coral is dying, emissions are increasing and our planet is getting hotter, all in the name of corporate greed. *this article was originally posted at https://www.theguardian.com, all rights are held with the original author Bill McKibben and The Guardian. When a body falls on the street, the police come to investigate. Did this person die of natural causes, or was there foul play involved? When a reef dies, we ask the scientists. And this year they’ve told us the answer in no uncertain terms. The amazingly rapid die-off of a huge percentage of the world’s coral reefs is not a sad but normal tragedy; it’s a crime. Perhaps the fastest, most widespread crime of the global warming era. Vast swaths of coral were bleached this spring, much of the damage done in a matter of weeks as a wave of warm water swept across the Pacific and west into the Indian Ocean. The immediate culprit was clear: the ongoing rise in global ocean temperatures that comes from climate change. But that’s like saying “he was killed by a bullet”. The important question is: who fired the gun? We know the biggest culprits now, because great detective work by investigative journalists has uncovered key facts in the past year. The world’s biggest oil company, Exxon, knew everything there was to know about climate change by the late 1970s and early 1980s. Its scientists understood how much and how fast it was going to warm, and how much damage that was going to do. And the company knew the scientists were right: that’s why they started “climate-proofing” their own installations, for instance building their drilling rigs to accommodate the sea level rise they knew was coming. What they didn’t do was tell the rest of us. Instead, they – and many other players in the fossil fuel industry – bankrolled the rise of the climate denial industry, helping fund the “thinktanks” and front groups that spent the last generation propagating the phoney idea that there was a deep debate about the reality of global warming. As a result, we’ve wasted a quarter century in a phoney argument about whether the climate was changing. Had Exxon and its ilk merely told the truth, that argument would have been over: no one would have accused them of being “climate alarmists”. We would have gone to work to solve the problem. Our work wouldn’t be over by now, but it would be well advanced; the atmospheric level of CO2 wouldn’t have topped 400 parts per million, and the temperature rise wouldn’t be flirting with 1.5C. There would be coral bleaching, but there likely wouldn’t be a coral massacre on the scale we’ve seen this year. Which means that the victims should be angry as well as sad. The people who depend on the reefs for food, and for shelter from the waves; the economies that count on tourist dollars; the people who take spiritual sustenance from the ongoing drama beneath the waves. The reefs can’t be made whole again: if they recover at all it will be slowly, and in the face of ongoing warming that seems unlikely. But at the very least, the nations that sustained this damage should be compensated. Exxon and its brethren made record profits in the last decades of denial and deceit; that money should rightfully go to pay for the damage it caused, and to build the energy systems that can power our lives without destruction. We need to remember that there’s nothing natural about this horror. It was caused, as so many crimes are, by greed. And that greed is ongoing – Exxon continues to search for more hydrocarbons, and to reject even modest changes to its policies. That’s why we’re wrapping crime scene tape this week around those bleached coral heads, those dead staghorns. That’s why we’re taking crime scene photos with underwater cameras. That’s why we’re protesting on the reefs. We’re not going to let them get away with murder. Previous post: Gender Equality at the Olympics? You’ll have to wait for 2020. Next post: Elitism on Campus? Great pick Stefaan. Isn’t it paradoxical that most of the people who run the destructive MNCs were once students too and most likely had and have access to environmental research.